Ruffle socks and high tops framed the fitness world DeShay Williams unknowingly entered in 1988, a University of Virginia student whose freshman roommate was about to lose her athletic scholarship. A lifelong athlete, DeShay decided to learn about the body after being rejected from the business school—instead majoring in Sports Management as part of UVA’s Curry School of Education. When there weren’t enough graduate students to teach an aerobics class, she got her first taste of life as an official fitness instructor on the forefront of every trend. 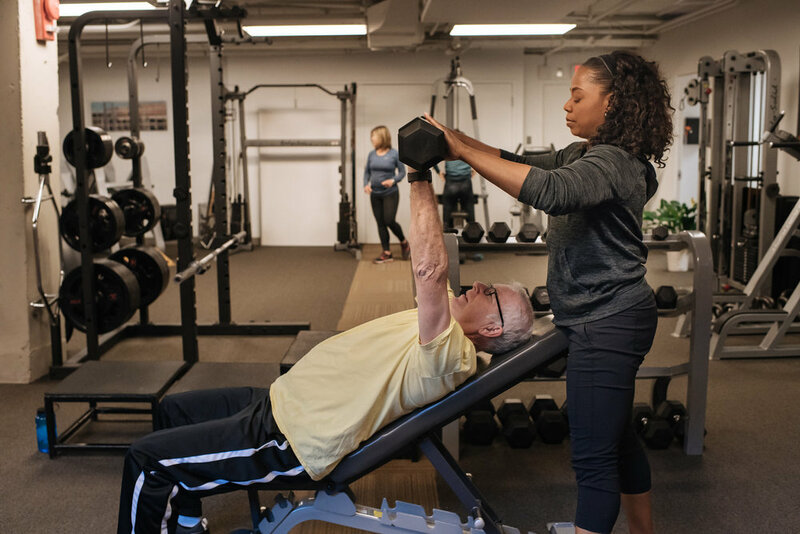 After graduating and moving to DC, DeShay eventually began working at a sports club not far from Definitions—an independent personal training studio in Georgetown owned by former accountant Earl Williams. They met at an annual fitness convention in Crystal City, but Earl doesn’t remember that. Two years later, they reconnected when DeShay went to see the new bikes at Definitions—the first studio in the District to offer Spinning. Married in 2000, DeShay and Earl have been running Definitions together for over 20 years. Originally a ‘teeny tiny’ suite, today the gym covers the lobby level of 1050 Thomas Jefferson Street. Personal training has always been their main business, but DeShay and Earl also offer their brand of interval classes—MRT—and rent their space to independent contract personal trainers. First and foremost, DeShay is an educator, teaching clients how to move beyond calorie burning and learn how to train their own, unique body. DeShay’s clients span every walk of life, body type, and generation. Her oldest, a 99-year-old Georgetown man who’d been with her for two decades, passed away in November. Her youngest, a 12-year-old with severe scoliosis. The young girl needed surgery, but her doctors wanted to delay putting a titanium rod in her back until she finished growing, lost weight, and gained more strength and flexibility. DeShay created a tailored training program for the girl, who lost 25 pounds and successfully underwent surgery. When DeShay visited her afterward in the hospital, the doctor said she’d recovered faster than any patient he’d seen because her muscles were so pliable. In DeShay’s world, there’s no compartmentalizing. When her children aren’t working out at Definitions, DeShay says Earl is either at home making a class playlist, at Costco picking up gym towels, or they’re out at dinner, evaluating a stranger’s posture. For a family that eats, sleeps and breathes fitness, DeShay understands most people don’t love to do pull ups and sprints. It’s about meeting them where they are.